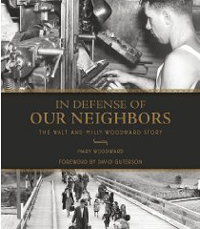 Mary Woodward's debut book In Defense of Our Neighbors: The Walt and Milly Woodward Story (2008) is a deeply personal account of the lives of the author's parents Walt and Milly Woodward. The book is also an important record of both local and American history. The Woodwards, owners and editors of the Bainbridge Island Review, were the first newspaper publishers on the West Coast to condemn the internment of Bainbridge Islanders of Japanese ancestry during WW II. With courage and perseverance, the couple - Walt, a Seattle Times reporter and Milly, a librarian and teacher - turned their newspaper into a voice for constitutional and human rights. More than half a century later, their daughter Mary tells their story. Digging through family archives and working closely with members of the Bainbridge Island Japanese American community, Woodward's book presents a true historical account and is nothing short of inspiring. Says Media Newswire: "[the book] offers a unique perspective on a troubling chapter of American history. Woodward, who still lives on Bainbridge Island, is well positioned to offer insights on a community that approached this crisis like no other in the country - and the brave, principled couple that today remains a symbol of heroism to the Japanese American community and defenders of civil liberties." A reviewer on Amazon concludes: "Thank you, Ms. Woodward, for telling the story of Bainbridge Island, so that we might all know and learn".